BMH Books continues to impact other cultures and languages around the world. 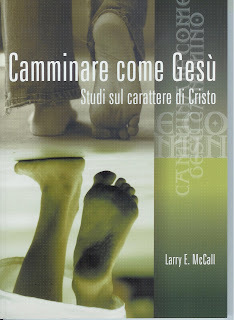 Copies of Larry McCall’s book Walking Like Jesus Did published in the Italian language arrived in the BMH offices this week. Subtitled “Studies in the Character of Christ,” the book has 17 easily accessible chapters that make an excellent framework for ABF studies, small group, or one-on-one mentoring activities. Also recently published in the Dutch language, the Italian edition was published by the Associazione Verita Evangelica, affiliated with Aurora Publishing, at www.istitutobiblicobereano.org. McCall, a graduate of Grace College & Seminary and originally from the Kittanning, PA, Grace Brethren Church, has pastored Christ’s Covenant Church in Winona Lake, IN, since 1981.